Fly Casting and Fly Fishing Schools for Massachusetts, New York and other Northeast Locations are offered for all levels of experience. Fly fishing and casting instructions with single-handed and two-handed rods are detailed for beginners to advanced fly casters. If your looking to get started in the fastest growing sport in North America or advance your current levels of experience, then Walt Geryk's Fly Fishing and Casting Schools are for you. "Learn to relax and fly fish with confidence." Just a quick note to say thanks for the Spey School experience. It was great to hang out with fellow enthusiasts in a great setting, but most of all I'm grateful for your excellent instruction. I was pleasantly surprised by how much progress you managed to make through my thick skull and in reorienting my own uncoordinated motions in just 2 days. I definitely left wanting more, so I've marked the calendar for a return to Altmar around mid-September and again in November. Between now and then, I'll take a lighter 2-handed rod out on the Potomac and Shenandoah Rivers for smallies and practice as best I can. Looking forward to putting the new Hardy reel and a 14-footer to work later in the year, and then out west next winter. All part of the pre- retirement training program. Thanks for putting your passion to work for the betterment of us passionate anglers. casting, presentations and techniques for those who would like to enhance their current fly fishing capabilities. By learning and understanding the reasons for proper presentations and proven techniques to be successful on many of the world rivers. These techniques and variations will make you better understand the the when to and places for these presentations. detailed instructions for the above presentations and fishing techniques that is sure to increase your success on the water. This is a great way to get to know about to the different styles of fishing presentations, decide which you may enjoy more, and expand your approach and success while on the water. Learn two-handed spey casting and how to adapt it to your single hander. Increase distances and enhance effectiveness for both dry and subsurface fly fishing in many situations. "Learn to Fly Fish with Confidence"
does not make a better angler, Learning the Skills Will"
Learn and understand the working dynamics of a fly rod, reel, leaders and lines. The casts needed for basic fly fishing, overhead cast, false cast, single haul. Continue to advance your fly fishing and casting abilities. Learn to over-head cast, false cast, single haul, double haul, roll cast, tuck cast, steeple cast, mini sink tip line vertical tipping, Understand presentations and effective drifts for dry, wet, nymph and streamer fishing for increased success. How to read water and determine where the fish are likely to be holding and feeding, and where I needed to make my presentation in order to get them interested in my fly. How to Cast so that I could put my fly where it needed to be for the best presentation. How to manage line to maintain a good presentation for as long as possible. I can’t thank you enough for all your patience, feedback and encouragement. You’re a great teacher and guide, and I am looking forward to spending more time together on the water. Using your Hardy Zenith 10' 5 wt fly rod for the day was a great opportunity to compare with others , which just don’t seem to match up with the Zenith and I look forward to my new Hardy and Airflo purchases. Again, thank you Walt, for a great time. I just wanted to thank you for taking the time and trouble to teach a 64 year old lifetime left handed fisherman the right handed double spey. The technique took all of the pressure off my arthritic shoulders and allowed me to have a great time salmon fishing. I am looking forward to adapting it on my home waters for trout. Thank you again, and I look forward to floating the Salmon River with you again next year. Before investing in your equipment, first learn the basics and more while casting Hardy and Greys single and two-handed rods and reels loaded with Airflo Lines. Let's be sure your rods and lines are balanced to allow for your ease of casing and to achieve maximum performance. September-December and April-May on the Salmon River NY. Deerfield River Availability beginning in May-September. All Reservations to be paid in full 30 days prior to class. If your paid in full spot is re-filled, your full payment may be applied towards another group or a (1 on 1) class. We really enjoyed our days fishing with you! It will always be remembered by Charlene and especially me. I will always remember the expressions on your face that day as you tried tirelessly to work your magic with Charlene to get her that first fish. I almost feel bad in the sense that with all your efforts throughout the fall that you don’t get to see the fruits of your labors. I will always look back on the first time you met Char and worked with her with the spey rod. You called over to me and with a grin said: "Your 'e in trouble, she's a thinker ". That she is! Unfortunately the part you don't get to see is the part where the thought processes all come together! Sometimes it takes a few days but she eventually she gets it and all your instruction came to fruition. It has been a real joy for me to watch her from a distance when she puts it all together and to see the smile on her face when she knows she’s got it right. I always think of you at those times and wish you were there so you could see the results of your efforts. That magic moment when we get lost in what we are doing, the river, the casting, you know we all feel it. The moment that turns into hours watching the cast unfold time after time and the satisfaction of getting it right. Yeah she gets it and it's all due to your willingness to share with us and your never ending desire to see your students succeed! We will always be in awe of you with your knowledge and skills. I have never seen or met anyone who I enjoy more then you, watching your casting and fish and abilities. The thing that sets you apart is that even though you stand a head above most "you are one of us" which makes you different than any guide and instructor I've ever seen. You're always up for a joke be it on you or us. You offer an enthusiasm that's contagious, and for that we thank you! So back to that day! The numerous times I looked over my shoulder and saw your reactions, that look on your face, the "what do I have to do to get this woman to catch a fish" look. Well it's etched in my mind and I will always smile and even laugh every time I remember it. My only regret is that when she finally caught her first you weren't there to see it. For it was in that magic moment that you helped her create, that moment when you were not there and Char put it all together and caught that first salmon! It would've been fitting that you be the one to watch instead of me. She wanted to show you that she got it right. THANK YOU once again for a memorable fall and we look forward to the next time we fish together. Learn the casts needed to fish river right and left. Single Spey, Dble Spey , Snap T, C Cast, Wombat and others needed to fish in all conditions. Continue to advance your Spey and Scandi casting abilities. Add the Snake Roll to your current abilities and variations in casting techniques to adapt to changing conditions and locations. Understand sink tips, fly tracking, proven presentations and effective drifts to increase your spey fishing success. Just a note to thank you for the great day spent learning the two handed Spey Cast. As you know I had never tried it and your clinic really got me started on the right track. There is a lot to it, river right, river left, retracing your cast and what I liked the most watching the fly turn right before the forward cast. You have a great approach for teaching the method and coaching through the steps. The Deerfield River is an ideal classroom. Really enjoyed the day. The consensus from all was that the day couldn't have gone better. Zeke fell asleep in the car within 5 minutes, and upon our return, the trip came up repeatedly all night. Shasta and Zeke seemed most perplexed about how to recreate the trip where they live, which is of course impossible. So we're hoping this will be a springboard to getting them up here more often. And thanks for choosing the Gorge. Beautiful location and highly approachable water. You're a superb guide, and friend. Thanks for the immense patience and expert instruction for all! PS Loved both that 10' Hardy Zenith and the Greys XF2 Streamflex that you let me cast and fish during the day. Kudos to Hardy & Greys! Swinging, Tracking and Drifting flies on the Salmon River New York and Deerfield River Massachusetts for trout, salmon and steelhead is a style growing in popularity. The Salmon River NY, Great Lakes Tributaries and the Deerfield River are favorites for swinging wet flies and larger spey flies and streamers in the Northeast and New England. Be part of this growing sport and see how you can easily advance your current fly fishing skills. These schools are for all levels of experience which allow you to gain confidence and advance your casting and fishing abilities while learning two-handed and single hand spey and fly casting, with the many proven techniques and presentations acquired by Walt's traditional fly fishing experiences on the rivers, since 1972, in the Northeast. To present flies effectively, understanding the fly is important. Fly profile, proper speed and line control is needed for optimal presentations while fly fishing, as well as a properly tied fly to a leader are major elements required to achieve maximum effectiveness and success. Learn what it takes to fly fish effectively, to fly fish with confidence and more at Walt Geryk's Spey Casting and Fly Fishing Schools. Fly and Spey Fishermen are frequenting the Northeast and Canada for salmon, steelhead and trout with Walt Geryk and his in-depth knowledge of single and two-handed casting and fishing style. Experience Walt's unique ability to teach the technical aspects of each and every cast from the beginning to the fly presentation. 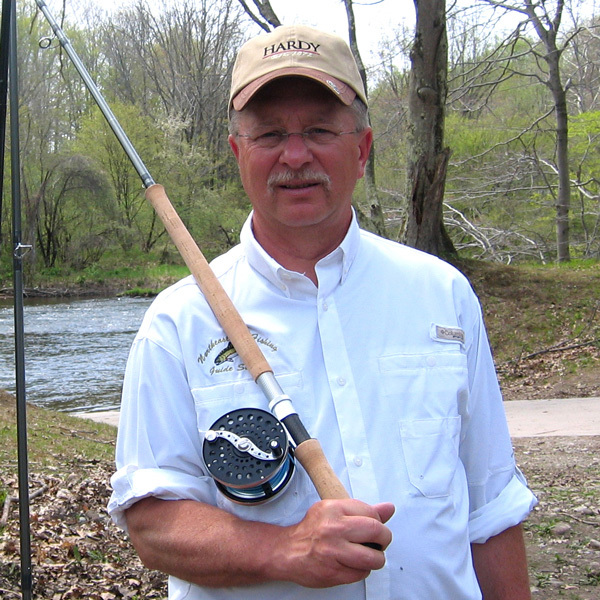 Learn to recognize spey casting faults and how to easily correct them. Understand the importance of body posture and positioning as the Hardy, Greys and Airflo Pro coaches you through the day. Feel the excitement of the pull and the satisfaction from the safe release of your catch. © Copyright 2012 by Walter Geryk and Northeast Fly Fishing Guide Service. All Rights Reserved.